Judging from the text on the wall, I'll assume that "Hi" (as in the greeting) is the correct way to pronounce the first word. Soon after placing my order, I received a complimentary Miso Soup (courtesy of the house), which kept me well-entertained before my first dish came. The Miso Soup was garnished with green onion and tofu. 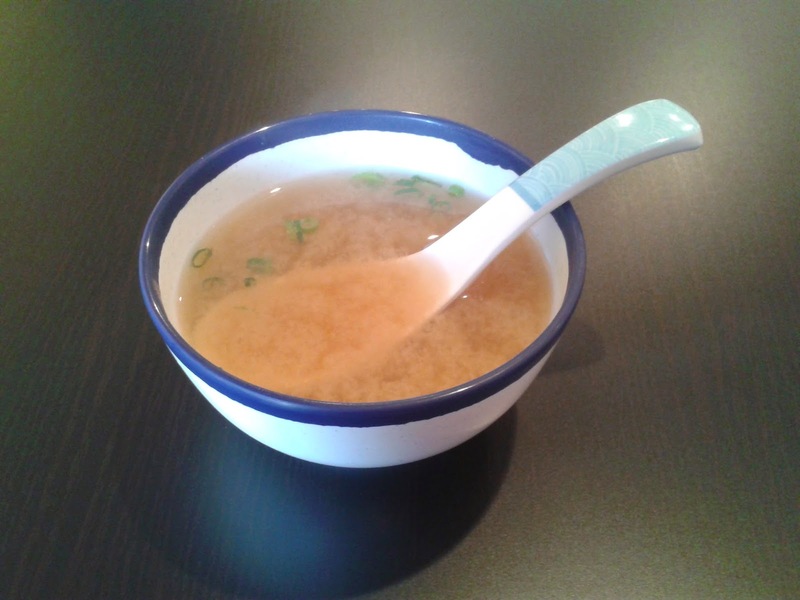 It was slightly heavy on the salt, but there was a good balance of miso paste and dashi broth. The Seasoned Tuna Tataki Nigiri was dressed with spices and some pepper, which helped give it a torched taste. Unfortunately, the seasoning made the nigiri taste very salty and the tuna tataki lacked moisture. The Toro Nigiri came with good quality sushi rice under a piece of fresh and remarkably soft toro. The toro was also cut very thin, so you would taste more rice than fish. 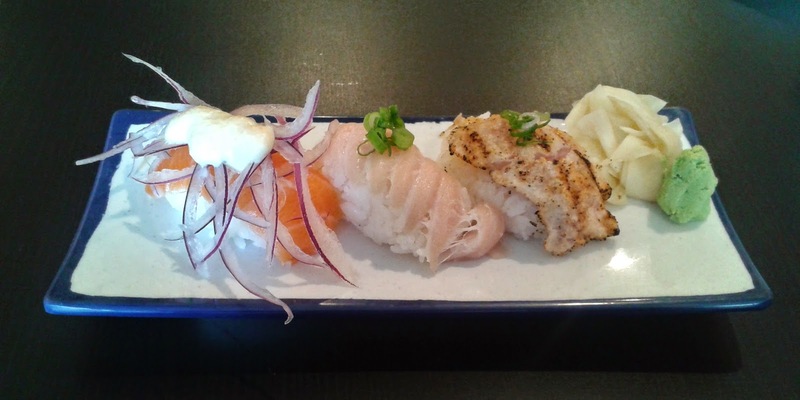 The Salmon with Topping Nigiri came with questionable toppings. Onions? Did they get that idea from Tairyou Ichiba? The white dressing on top is a chilled apple sauce, which has a mildly sweet taste. The Torch Roll came with crab meat, prawn tempura, avocado, tuna, salmon, fried green onion and house sauce. The whole roll is then lightly torched to give it an appetizing, seared taste. The crab meat had a desirable sweet taste and the prawn inside was almost as soft as amaebi (raw sweet shrimp). Some of the pieces had crunchy tempura whereas some pieces did not. The house sauce is a Japanese hot sauce mixed with a light teriyaki sauce. Overall, there was a good balance of flavours, especially with the crab meat and prawn tempura inside the roll. The service from the waitress was quite attentive, and she really tried to make my visit as enjoyable as possible. I had also ordered the Ebi Mayo, which was prepared incorrectly (they forgot to remove the shrimp shell). The waitress noticed something wrong as she saw my face while I was eating it, and promptly apologized and took it off my bill without me asking. There have been many cases in which I had incorrectly prepared food from a restaurant, but this one was dealt with by far the most efficiently. If I did not have an appointment right after, I would have ordered the dish again because it looked quite promising. In either case, I highly commend the waitress for her excellent service. 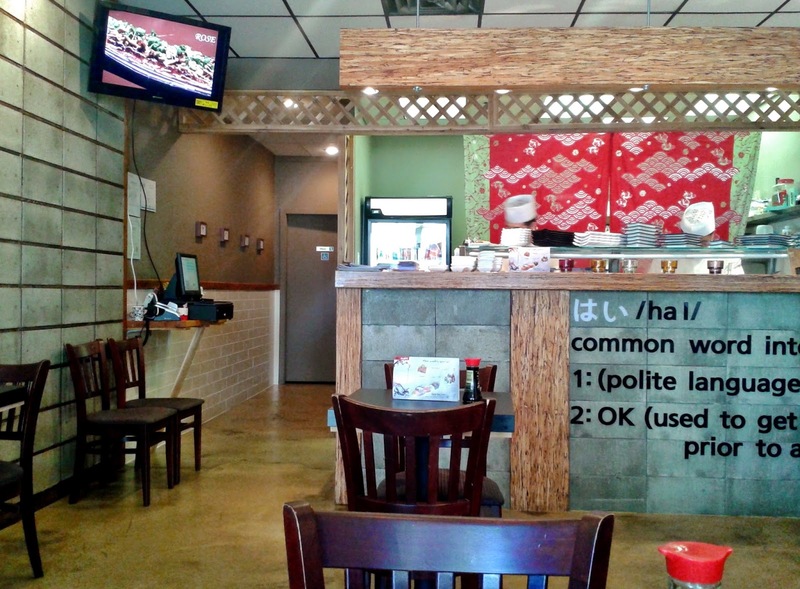 With fantastic service and mostly well-prepared food, I can see why Hi Sushi has a 100% rating on Urbanspoon. Another reason might be that anyone who writes a review for them on Urbanspoon or Yelp during their visit receives a free Chicken Karaage (offer valid as of the date of my visit)! Too bad I have a Samsung Galaxy Ace, and it would have taken me a full 45 minutes (lag time counted) and some expletives just to write a one- or two-sentence review. 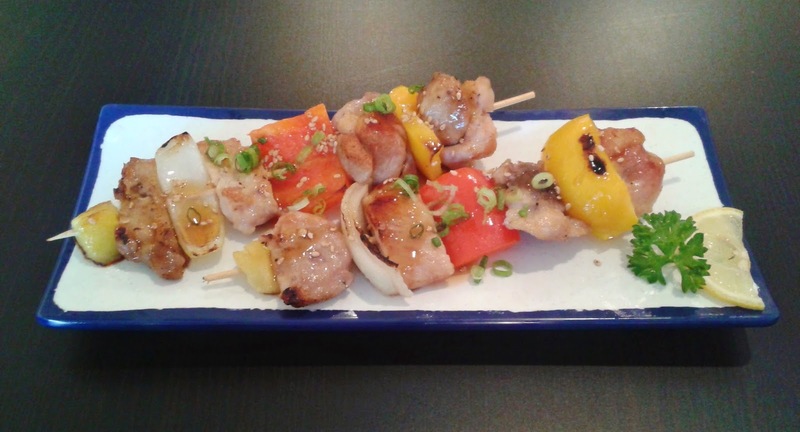 Chicken Karaage or not, they deserve both a review and a like from me on Urbanspoon.